Lovingly created Feringa Kitten is a premium dry food for baby cats. The recipe is a delicious combination of easy to digest poultry, enriched with a little pumpkin, cranberries and a pinch of catnip. 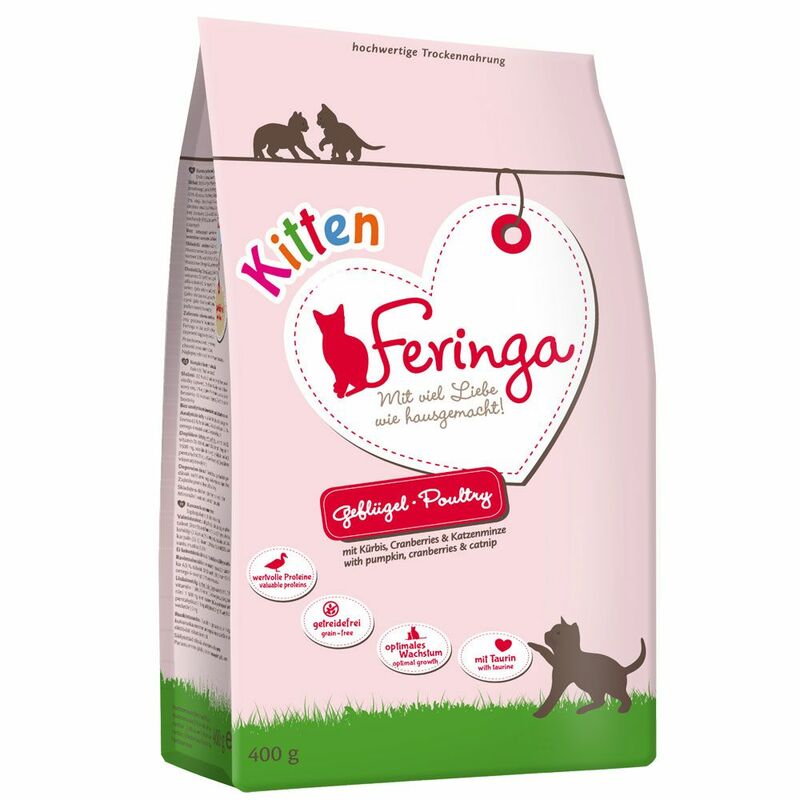 Feringa Kitten is made to suit the specific needs of kittens aged 2-12 months. It is also suitable for pregnant or lactating mother cats. Young cats are full of energy and constantly on the go. These little cats need plenty of proteins, nutrients and vitamins, far more than fully grown cats and Feringa Kitten is ideal for young cats. Feringa Kitten is a natural and wholesome, grain-free dry food. Digestible poultry meat provides lots of top quality animal protein. The carefully selected ingredients are gently prepared, preserving the natural nutrients and authentic flavour of this premium food. Your kitten will love it. Your young cat's digestive system is not designed to proceΒ large amounts of grain, so Feringa recipes contain absolutely no grains. Feringa dry cat food is guaranteed to be a hit with even choosy cats. Feringa – lovingly prepared, just like home-made! Feringa Kitten dry cat food at a glance: High meat content: Feringa dry food is made from carefully selected poultry meat. It has a higher percentage of meat because young cats need plenty of animal protein when they are growing. Cats are natural carnivores, and Feringa provides a natural, species-appropriate diet. No grain: Feringa contains absolutely no grains, as kittens and cats are not able to digest them in large amounts. This grain-free kibble provides your pet with species-appropriate nutrition. Gentle preparation: All ingredients are gently prepared to keep the valuable nutrients and natural flavours fresh. High quality ingredients: Feringa contains no meat or bone meal, vegetable by-products, meat by-products, artificial colourings, preservatives or flavourings. With premium salmon oil: Salmon oil is rich in valuable omega 3 and omega 6 fatty acids. These play a vital role in maintaining your cat's healthy skin and shiny coat. With cranberries: Cranberries are naturally rich in vitamin C and flavonoids, which are important in protecting against free radicals. With vitamins and taurine: The addition of taurine and vitamins provides your cat with all the nutrients it needs for a healthy, balanced diet. Ideal calcium-phosphorous ratio: The calcium-phosphorous ratio of your cat's diet plays a big role in your cat's health. The ratio in Feringa dry cat food is 1. 15:1. Soya and lactose free Feringa is a premium quality food, so it is naturally free from soya and lactose, making it ideal for sensitive kittens and those with food intolerances. Feringa cat food is made with love and care by a small family busineΒ in Austria, where creating natural and species appropriate nutrition is at the heart of the busineΒ. Feringa – tastes just like home-made!.